So You Want To Mentor Under Me? Here’s a question I recently received. Since I get questions like this pretty frequently I thought you might be interested in my answer. I’ve been looking for a mentor. Especially a Halbert trained mentor. I just want someone who’s “been there done that” to talk with. I don’t need a lot of hand holding. I just want feedback on my copy and on running a small copywriting/marketing consulting business. For the right arrangement, I’m willing to offer great value. What would it take for you to consider mentoring a promising copywriter? I’m quite honored you would be interested in mentoring under me. As I get older I’m realizing (and accepting) more and more of mine. I’m probably the guy you would want to mentor under to learn about being a “kitchen table entrepreneur”… but I’m NOT the best guy to mentor under for copywriting and learning the freelance biz. There are FAR better teachers of that. Allow me to make a few suggestions. 1. Read EVERYTHING Clayton Makepeace has written about copywriting and marketing. Let me rephrase that to… Read EVERYTHING written by Clayton Makepeace. If you can get your hands on his grocery list, read that, too! Now THAT guy is a GREAT teacher of copywriting and marketing. His site at http://www.makepeacetotalpackage.com is a multi-million dollar education (literally!) 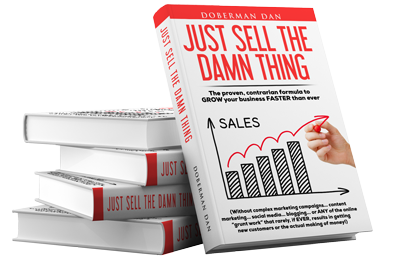 in direct response copywriting and marketing… and amazingly it’s free. As far as learning the freelance business, he has an excellent course called “PROVEN SECRETS FOR EARNING SIX-FIGURE ADVANCES AND SEVEN-FIGURE ROYALTIES…”. I highly recommend that. In fact, I’ve bought every product Clayton has come out with (and will continue to do so) because there is soooooo much value in them. If I can just know about 10% of what that guy knows I will consider myself successful. Now if you could mentor with Clayton, THAT would be the guy to mentor under. I think the only way to do that would be to become a copy cub and work for him. You ought to check into that. If I weren’t so spoiled by my kitchen table entrepreneur lifestyle I would drive up to North Carolina in a heartbeat and BEG Clayton to accept me as a copy cub. 2. Read everything at http://thegaryhalbertletter.com. Again, a multi-million dollar education in direct response copywriting and marketing… for FREE! If the Halbert boys decided tomorrow to charge $1,000 a month for access to the site, I wouldn’t hesitate in giving them my credit card #. Luckily for us, they are keeping it free. 3. Read everything written by John Carlton at http://www.john-carlton.com. He also sells an excellent freelance course at http://www.carlton-freelance-course.com. 4. Check out http://www.carlinecole.com and sign up for her eZine. I wish she would sell copies of the DVDs of the copywriting seminar she did last year. It was one of the best ever. We should probably bug her until she starts selling those DVDs. But until then, there’s some great info in her eZine and website… again, for free. 5. Read Michel Fortin’s blog at http://www.michelfortin.com. Lots of good stuff there. I know when Gary Halbert would speak with Michel, he’d take tons of notes. Need I say more? I’m probably forgetting a bunch of other good resources and I certainly don’t mean to leave out or slight any of my colleagues… these were the first resources that came to mind. In the next week or so I’m going to do a free tele-seminar and will be glad to answer some copywriting questions… so keep an eye out for the tele-seminar notice. I’m also trying to find a place locally that will host some classes about starting direct response/Internet businesses… and also teach owners of existing business owners how to use direct response marketing to increase their sales. The idea is to videotape these classes and post them here. So you actually WILL get to mentor under me… just not one on one. Again, thanks for your request. I took it as quite a compliment that you would be interested in mentoring under me. Previous post: Wanna Hear Some Dirt About Gary Halbert?